The new Estwing Black Eagle tools are designed for the sportsman, serious professionals, and military. The lightweight design makes them easy to carry, perfectly balanced, weighted and built to last. Designed and Made in USA and forged out of 1-piece American steel. These tools have the world famous and patented Estwing Shock Reduction Grip. The grip which reduces vibration up to 70% is bonded on and will not come off. This Tomahawk style axe is perfect for cutting, trenching, digging, excavation, and operations including breaching, extrications. These axes are the worlds best. Protect your eyes from flying particles and dust. Always wear safety goggles. Bystanders shall also wear safety goggles. Tbook.com crawls the web to find the best prices and availability on Estwing and related Tools and Hardware products like Estwing Tomahawk Axe Leather Grip. For this page, related items include products we find that match the following keywords: "Estwing" at our vendor partner Home Depot. 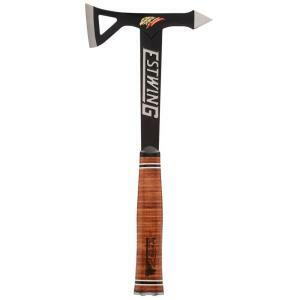 Estwing Tomahawk Axe Leather Grip is one of 156 Estwing and related products listed in the Tools and Hardware section of Tbook.com If you have any questions on this product, please give us a call at 734-971-1210 during the hours of 9am - 5pm EST for assistance. Thank you for shopping at Tbook.com, the Internet Department Store!